The Star Rod is a major item appearing in Kirby's Adventure and its remake, powering the Fountain of Dreams to send dreams to everyone in Dream Land. The Star Rod also appears as an item in every Super Smash Bros. game. The Star Rod can be used as a battering item, or by using as Smash Attack the player can shoot out a star at opponents. The Star Rod can shoot twenty stars. Two characters swing their Star Rods in a different manner than the rest: Sheik shoots two stars one after another while Captain Falcon shoots one, then four stars at once. In Super Smash Bros. Ultimate, the Star Rod appears as a Spirit. In order to obtain the Spirit, the player must fight four Kirbys that use Star Rods. 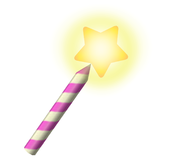 5/93 This magic wand holds 16 star shots and sends foes flying at a low angle when thrown. It's most powerful when Captain Falcon or Sheik performs a Smash Attack while holding it. In Kirby's Adventure, the Star Rod is the secret power behind the Fountain of Dreams. King Dedede steals the Star Rod in order to seal away the nasty Cloaked Nightmare. NES Kirby's Adventure A magic wand. Perform a standard attack with it, and it's a battering weapon. Perform a strong or smash attack, and it fires a barrage of star shots. Throw it at a foe, and that opponent will get sent flying sideways. In the Kirby series, the Star Rod is the power source of the Fountain of Dreams. King Dedede once stole it to imprison the Cloaked Nightmare. GBA Kirby: Nightmare in Dream Land (12/2002) Swung normally, this item will deal a regular physical attack. But if you charge up the blow, it becomes a magic wand that launches stars! The Star Rod is the source of power for the Fountain of Dreams in Kirby's Adventure. Using the rod, Kirby was able to defeat Nightmare. This page was last edited on April 7, 2019, at 12:32.